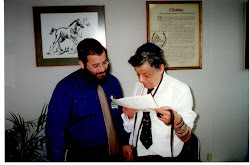 In the months leading up to the summer of 2000, I worked with a friend on organizing a summer program for 14 teenagers who were struggling with issues related to their yiddishkeit. The program was to take these young men on a trip of their lifetime, a five-week adventure through California, Arizona, Utah, and Nevada. We needed to find a few "solid chevra" to be counselors for this program, guys who would not only be able to give these teenagers an amazing time, but who were also Chassidishe bochurim who would be Dugma Chaya for them. While davening in 770 one morning, I saw Levi from across the Shul and immediately imagined how great it would be if I could get him on board. I had never learned in the same Yeshiva as Levi, but we were about the same age, both from Crown Heights, and were acquainted with each other as our paths had crossed here and there. I approached Levi that morning and did my best to pitch the "offer" to him. Levi seemed genuinely enthusiastic about the idea. He told me he was definitely interested, but had already been offered another job for the summer and would have to wait to see if that worked out before giving me a definite answer one way or the other. But Levi didn't leave it at that. He offered right then and there to help me out. I had explained my plan that the traveling camp would spend the nights either camping out at some of the state and National Parks out west or at Shluchim along the planned route. Levi unhesitatingly suggested that he could start making phone calls to various Shluchim to arrange lodging for the nights we did not have plans to camp out. A short while later I got back in touch with Levi. He told me that his original summer plans had gone through and he wouldn't be able to join the program as a counselor. But, in the mean time, Levi had arranged lodging by Shluchim for what turned out to be 18 campers and staff for many nights during the first three weeks of the program.